Florida sure is a bird photographer’s paradise. I traveled to Bonita Springs last June and was met with photographic opportunities everywhere I looked, from Ding Darling NWR to a popular beach near hotels. The image featured here was near a nesting site behind a row of hotels on a fairly busy beach. The bird nesting areas are roped off to allow the birds to nest without being disturbed but to be honest, I think the taped areas need to be larger as people routinely walk right up next to the taped area and are met with birds dive bombing their heads to let them know they are too close to their nest. 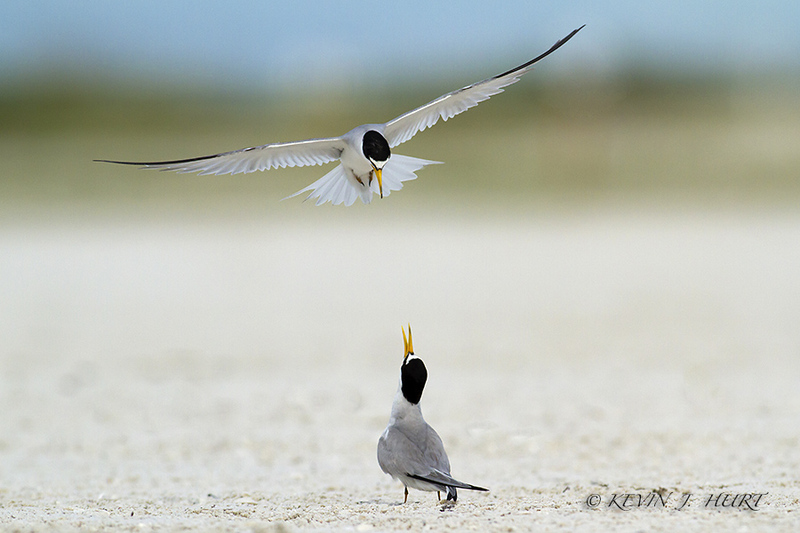 The least tern is a small bird and I knew I would have to get close to get the shot I wanted, even with the 500mm on a Canon 7D. However, I did not want to disturb them on their nests. So, when I was probably 40 yards away from this pair of birds I got on my belly and began a slow methodical crawl toward them. I don’t know how long it took but it seemed like forever as I inched my way closer and closer. Eventually, I felt I was close enough and began focusing on nesting birds while keeping an eye out for interactions. The birds had grown accustomed to my presence and paid no attention to this blob of a figure laying on the sand. I noticed the interaction of this pair of birds and waited for the right moment. The result is featured here. The key to this image was concern for the subject and a lot of patience to begin a low crawl way outside of photographic range.